As you may know, I love a good read. I recently posted about my top ten books from last year and finished off with Me Before You by Jojo Moyes. I really loved this book, and although I've seen a fair bit of hype surrounding it since reading, I'm surprised it hasn't been raved about more! I'd really recommend it, and will do a proper review soon. I've now just started reading Cloud Atlas - I've actually found it quite hard to get into, did anyone else find the same? I don't really have any idea what was going on in the first part, but am now onto the next character which seems more interesting. Hoping I get into it soon as have heard so many good things! Anyway, in my top ten post I discussed where I buy my books from. I tend to stick to charity shops for most books, but then will buy any 'special' reads new/first hand. I like to buy novels by my favourite authors new to add to my bookshelf collection! The problem is, our flat is tiny and we have very little room for... well, anything. Our bookshelf is very nearly full and I'm starting to get concerned about my ever-growing collection of novels. I know what you're all thinking... what about a Kindle? Well, both my parents have one and I have to admit I'm intrigued. It would mean travelling around would be a whole lot easier (I'm fed up with fraying book corners in my handbag!) and lighter, and would save space in my fit-to-burst bookshelf. I'm just not sure I can let go of good, old-fashioned books. I love that feeling of holding a book, turning the pages and yes, I'm going to be completely ridiculous and say I appreciate a pretty cover. Despite this, I took my Mum's Kindle for a 'test drive'... and have to say I was impressed. Its not like reading from a computer screen at all, which I was afraid of, and is so light it makes reading that new Marian Keyes hardback that little bit easier! I've also been lucky enough to have a go with the new Kindle Fire, and... wow. It is incredible! I've definitely picked up the technology buzz recently and feel the Kindle could be my next purchase... I'll be hitting up Carphone Warehouse very soon I think! I'd love to know what you think. Do you have a Kindle? Would you recommend it? 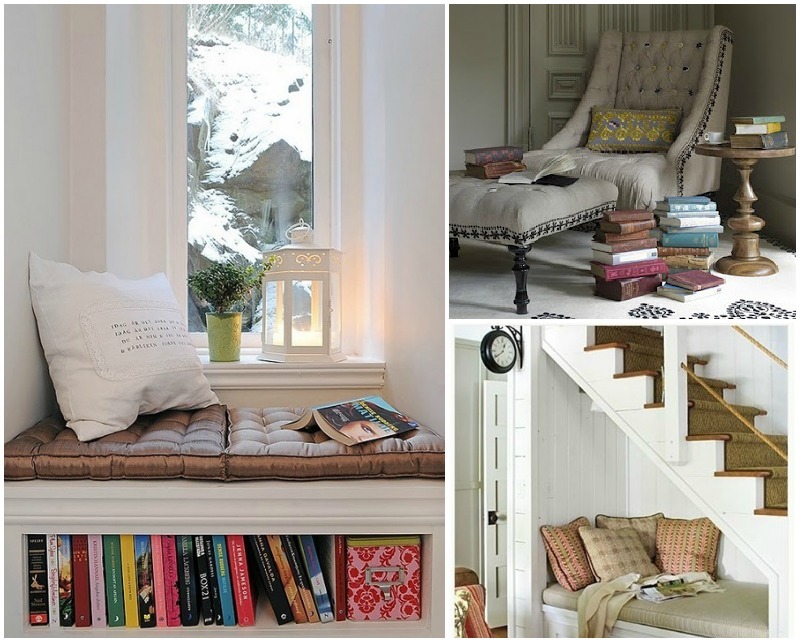 The perfect reading spot? All images from Pinterest. Same as Lauren. I was very anti-Kindle then got a Kindle Fire HD and it completely refuelled my love for reading. I still read proper books though. But find them too heavy to read in bed lying down. I watched Cloud Atlas last weekend and although very long (almost 3 hours) and a bit confusing I really enjoyed it! I bet the book is hard to follow though. I know what you mean about Cloud Atlas....I found it really hard to get into. In fact, I gave up reading it...and I hate not finishing books! I'll have to give it another go I think. I was always against kindles too hun until I won one in a comp my plan was to see what it was like and then sell it. This didn't happen I love my kindle now but I still buy paperbacks too who can beat the smell of a fresh new book. Ah a girl after my own heart - someone who loves a book with a good cover! I can echo the earlier comments, I was totally averse to a Kindle (or any other ereader! ), for me part of the joy of reading is going into a book shop and browsing the selection. I love the way bookshops and books smell, the feel of a book in my hand, turning those new crisp papers, picking up a book because I am drawn to the cover, the colour of it and the font, Oh God now I sound like a total weirdo! But I know book lovers will understand! BUT, I, like you, am running out of space for new books, plus I wanted something which was handbag/travel friendly so I asked for a Kindle for Christmas, which the bloke kindly got me. I wanted as simple an ereader as possible and one that had the 'look' of the pages of a book so I went for their standard version (was concerned the fire/hd would be too much like reading a computer screen) and I have to say I love it. I can devour books and sate my need for reading without filling my house to hoarder proportions of paperbacks. That said, I will still buy the occasional book from our local independent bookshop (gotta keep it independent in my book - no pun intended!) and from the local charity shops. I think a mix of having a Kindle for just reading and then buying books you really really want in book format is a great blend to have. I had a Kindle, but the screen broke, so now I'm Kindle-less. I'd downloaded a ton of classics which were free and I was working through, but now I'm back to books until I can get it fixed or enough money to get a new one (which is going to take forever!). Where I live there are tons of books to work through but I worry about taking them on my daily commute, having enough room in my bag etc. Plus my Kindle had 3G so I could go online on it too! I got a Kindle Fire HD for Christmas and it's so wonderful. Like you I didn't want to let go of good old books but my compromise is that anything my favourite authors publish I'll buy in book form and then anything else, I'll get on the Kindle. I hate fraying edges when you've had a book in your bag a long time so the Kindle is so easy and convenient and protects my lovely books from being ruined! With the Kindle Fire HD, you can also watch things like BBC iPlayer and LoveFilm which is really handy, as well as getting onto the internet and there's loads of apps (Facebook, Twitter and Pinterest are all on there). I'd definitely recommend it for the convenience, and the HD picture is awesome! I have a tablet with a Kobo reading app on and I love it, definitely easier than lugging around massive books! I thought I would hate the Kindle, as I loved the feel/smell of a book. But I absolutely love it! It saves my arms from carrying heavy books, my library is with me at all times, and it has introduced me to so many new authors due to the free books, and kindle daily deal. I would definately recommend getting one! 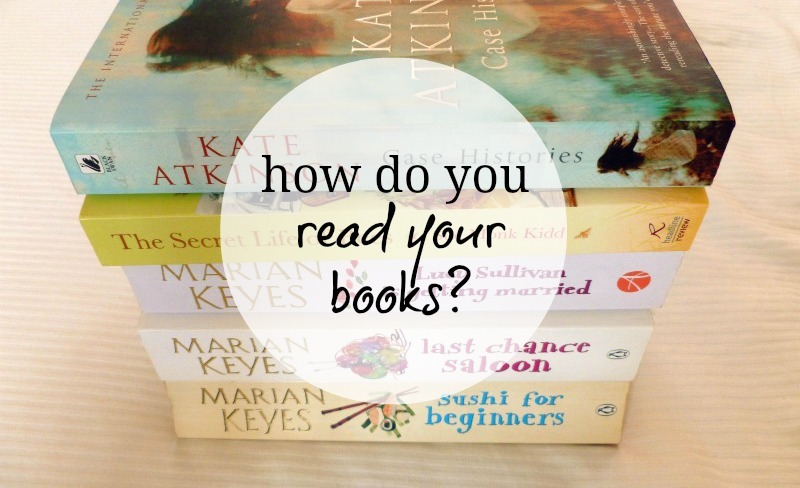 I flipping love my kindle, but I also love books. It does my head when people are all up in my face saying that I'm killing books. No, no I'm not. If I like it on kindle, I'll buy it in hard copy. Definitely take the plunge, the fire is awesome, you can do so much on it! They're just so much easier to carry around and more room in my bag is never a bad thing! I have thought about getting a Kindle but I like actually having a proper book! I do like to read paper books, but I've never tried a kindle. I've only ever read one book through Google reader but that was on my phone, so the screen was too small. I struggled with Cloud Atlas and I'm still not 100% sure I could tell you what happened! But I enjoyed the parts which were easier to understand (I especially stuggled with the robot section I think.) I really like Black Swan Green by David Mitchell though and would like to read his other books. I've always loved reading and it's worse now I work in a library, I bring home new books after evey shift... I don't really 'get' Kindles but I think Surrey libraries (where I work) lend e-books as well? So if you did get one it could be worth looking into with your local library. I don't have a Kindle, but I do have the first edition Nook. I love it. It has opened up a whole new world of books to me that I wouldn't have run out to get the paperback of. They are usually cheaper than the physical copy, so I don't mind paying a few less dollars for a book I'm just curious about. I love real books too, but I got a kindle last summer, and I like it very much. Of course, real books are still the loveliest, but I can use both. To me the best about a kindle is that in the space and wheight of a small book, you can have hundreds of them. When travelling it's super convenient. Also, when you go on holidays. I never lave for holidays without taking at least two books (who always happen to be thick). Although in the end, the few days that I'm away I don't read much and do other things instead, I ALWAYS take books with me. But they wheigh quite a bit, and I worry they'll get wrinkled or something. But with a kindle, you can always have lots of books with you, not only on vacations, but anytime you leave home, and read whatever you like while commuting. Its also very convenient for me because they give us lots of PDFs to read at university, and this way I don't have to print them, or ruin my eyes with the computer screen. Something to consider though, is what you want, an e-reader or a tablet? With a tablet (like Kindle fire), you can do almost as many things as with your computer (I think? ), and that's very nice. With an e-reader (like kindle), you can only read, but the e-ink screen won't tire your eyes. So if you plan to spend lots of time reading on it, instead of doing other things, it would be better for your eyes and wallet to get an e-reader. If you want to take advantage of technology and use it for lots of other things, then probably a tablet will suit you best. I have a nook and i am so in love with it. My fiend has a kindle, but I prefer my nook way more. I think they are both good- you should get one! I want to stick with books forever! I take ones I have read back to the charity shop or pass them along to a friend to read. I keep ones that I really liked though, and once the shelf gets full I do a purge. Kindles are snazzy and I'm not against tech, but...books are better.